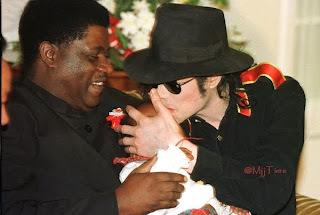 1998 - Michael Jackson kisses, 15 months old Melvi Nujoma granddaughter of Namibian President Sam Nujoma who is held by her father Utoni Nujoma. Michael is in Namibia to attend a summit held by the World Economic Forum and to look at investment possibilities in the country. The arrival of the pop star caused chaos in Windhoek.